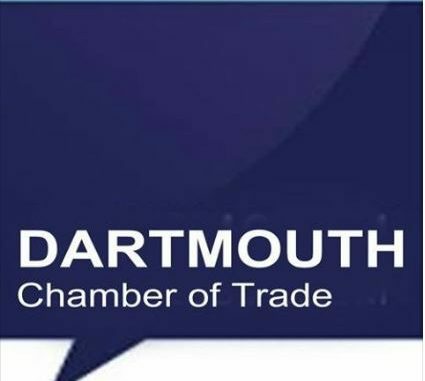 What does the Dartmouth Chamber of Trade and Business do for you? With only three days left to save the Dartmouth Chamber of Trade we are outlining here the benefits you could gain from the continuation of the Chamber. If we do not find 3 more business owners willing to give some of their time to join the committee and drive the chamber forward we will lose this valuable organisation. To protect the interests of the business community as a whole. If the business community is in good shape and successful, it will be positive for the local economy. 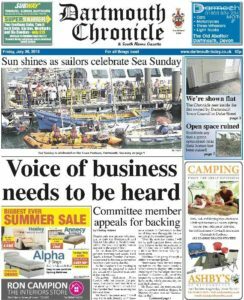 For the Dartmouth Chamber, this has to do with fighting unfair legislation, challenging business rates and protecting the interests of their members. To collect and supply useful information to their members. One of the best things about being a member of the Dartmouth Chamber is the networking as well as the growth and learning opportunities. Members receive very valuable information, support, and networking opportunities. Weekly footfall reports help you to analyse and understand business performance. To establish cooperation and a sense of partnership among their members. This is very important as its helps members to create partnerships and in so doing, give their business growth opportunities that it wouldn’t have otherwise. Chamber members look out for each other and support each other. To consult the Central and Local Councils/Governments regarding matters of trade, commerce, and industry. It is the role of the Chamber to be in contact with other town stakeholders such as the Town Council, Harbour Authority and District Council, to ensure that they have all relevant information to continue developing their members’ businesses and the economy. It is also important that they can give their input regarding legislation, parking and other matters. To draw up plans and projects for encouraging the growth of the trade and commerce in the town.This is one of the main and very important goals of the Chamber. It organises events and offers many opportunities where local businesses and Chamber members can grow and have a positive influence on trade and commerce in the Town. The 5 year strategic plan for the town developed by the BID team remains very relevant today, despite the failure to implement it. These benefits apply to most Chambers but during the difficult economic climate we have here in Dartmouth right now these are particularly important. Closure of Dartmouth & District Chamber of Trade and Businesses Ltd.
Why do you say 3 days Paul ? The Mayor and I have met and are working on a plan. Just because the Limited Company will cease to exist, does not mean that the Chamber will. The Chamber will survive whatever. Just a little puzzled, Dave: I was at the EGM and I heard you resign. So why are you working on a plan with anyone? 3 days for volunteers to come forward to serve as Directors of the Chamber. Without those volunteers then the Ltd Company will be in breach of company law and will probably be closed. What you choose to do to re-establish a new Chamber is up to you but at the EGM you all stated you were unwilling to serve as members of the committee. I ask again what has the Chamber of Trade got to do with the Mayor? It is the members who make decisions about the Chambers future, or have you forgotten that again? As someone who is a business owner with an interest in the Chamber, there needs to be some clarity on the way forward. Paul Reach was the only one to step forward at the AGM after Dave Cawley resigned. Now Mr Cawley is working with the mayor on a plan for the way forward, despite resigning his position! Does this ‘plan’ involve Mr Reach? I have sat on the sidelines for sometime. Now it is time to step up and be counted. Do we want a future for Dartmouth or not. Paul is aware that I have put myself forward to assist Dartmouth. I’m not interested in petty politics but the future of the town, step up and be counted. Still don’t understand the 3 days Paul, could you explain please ? Due to the actions of Paul Reach and Mark Simpson who stopped the closing of the limited company, I resigned as Chairman. No one would want the responsibility and liability of the debts previously incurred by the old Chamber and some thrust upon the old Chamber from the BID. Like anyone, I can talk to the Mayor about anything, and he is interested in keeping the Chamber afloat. The debts were incurred as a result of your failure to submit accounts and tax returns so they are your responsibility. Members voted at an EGM not to close the Ltd company because you were un able to clarify the nature of its liabilities and we felt it was unethical to close the company to avoid non specified debts As you were clearly informed by mark and myself no debts from the BID can be transferred to the Chamber, they are two separate and unconnected Ltd companies. Perhaps you would like to publish the details of these debts to help members understand. Only the members of the Chamber can decide the fate of the organisation and as far as I am aware the mayor is not a member. Not true of course, you have no idea about the latest debt and why no one in their right mind would want to take over the Chamber now. Before I explain further, for the third time of asking, what does this mean ? 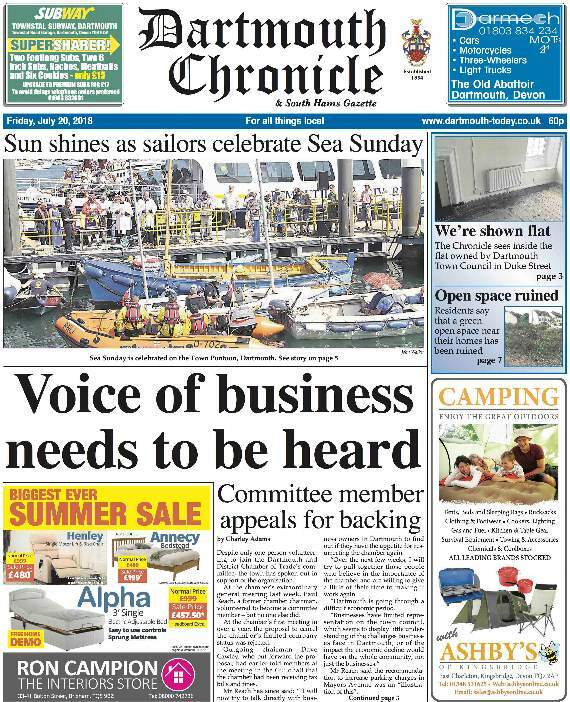 “only three days left to save the Dartmouth Chamber of Trade” ?? You have said it many times now. Dave, I have no idea about the debts because you have failed to declare what they are! Three days left refers to the fact that without enough volunteers I will be unable to sustain the current Chamber as it exists today, so I will abandon my attempt to recover the chamber. What you do is up to you but I cannot see many Dartmouth businesses getting behind your attempt to start a new, non-registered Chamber. Good luck with that one. Your determination to kill the Ltd Co with warnings about the debt burden will probably succeed, which will be a tragedy for an organisation that has survived all previous trials and tribulations for many years. What a legacy Dave! So the 3 days was just scaremongering, or Fake News. I don’t appreciate that. There were plenty of warnings, you even met with us in the Royal Castle Hotel a month or so ago, and we told you face to face ! BTW my legacy is good with several positive achievements and when the Limited Company is closed the Chamber will go forward, even now it exists and plans are being made.